Ala Moana Beach is used a lot by Japanese photographers. Kaori Takekoshi of La-vie Photography took pictures yesterday of newlyweds Miki and Norishige Tajima, married yesterday morning and having fun during their photo shoot. 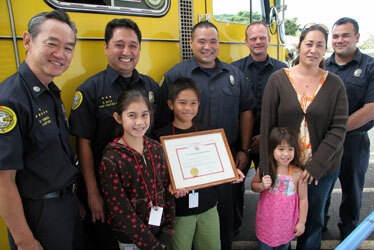 The Saffery family was recognized yesterday by the Honolulu Fire Department for practicing their escape plan when a Papakolea neighbor's home caught fire last October. Sunnie Saffery, left, Shaun, Shellie and mother Lei took a photo at Pauoa Elementary School with attending firefighters Capt. David Yamada, back row left, Robert Data, Jeff Miyasato, Brian Sheldon and Kirk Maluo. Pauoa Elementary School students were enthusiastic yesterday as their school was awarded $200 from the Gas Co. for 100 percent participation in completing the Fire Fighter's Safety Guide homework assignment. 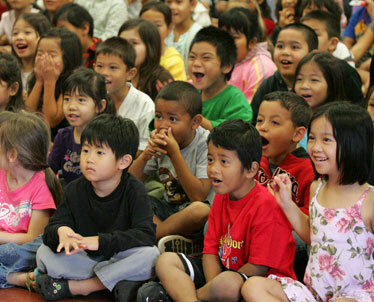 Students in the front row are Qellsy Villanueva, right, JB Aake and Jase Ishimi.